Note: Although my copy of this album is the 2005 Deluxe Edition, with bonus live tracks, demos, and DVD, I will only be reviewing the "main album," i.e. the remastered tracks recorded in 1983. I just don't want to get into a deep comparison of the original album versus the Deluxe Edition. I'd like to focus on the songs and the music, rather than production value comparisons, etc. The release of Fates Warning's third studio album, Awaken the Guardian, represents the moment they truly came into their own as a band. A fair criticism of their early work is that it was too derivative of other metal bands of the time, most obviously Iron Maiden. 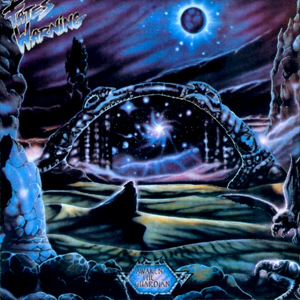 Fates Warning, though, was from the beginning a more progressive metal act. On Awaken the Guardian, they finally embraced their most progressive tendencies, allowing themselves to craft long songs with complex time and thematic changes, and make music fearlessly. As is the case with all of Fates Warning's work, a casual and uncritical listener will tend to miss the details, where much of the band's genius is found. If all you're prepared to hear from the band is thrash metal, then that is pretty much all you will hear from Awaken the Guardian. If you're like me, on the other hand, and you're a composition junkie, this album is so rich and fertile that you'll be discovering new elements to the songs for literal decades. I could write my whole review of the album from the perspective of the long-time Fates Warning fan that I am, expounding on the fact that Awaken the Guardian is probably the most beloved album in the band's body of work. I could praise its classic songs, "Prelude to Ruin" and "Guardian," and heap praise on original singer John Arch's powerful and unique voice and lyrics. But that's been done so many times already, and besides, what stands out to me about this album is not its position as a classic of the genre or as a testament to the "band that might have been, if only John Arch had stayed..."
No, what stands out to me about this album today, 33 years later, is how ground-breaking its compositional elements remain. Take the album's remarkable opener, "The Sorceress," for example. Although it is not remembered as a Fates Warning classic, its innovations are numerous and breathtaking. Most specifically, "The Sorceress" introduces us to Jim Matheos' highly unique approach harmony, with which he courts dissonance in unconventional ways, yet remains comfortably within a consonant framework. (If that sounds weird, it's because it's the best way I can describe what is a great artist's particular compositional "stamp.") At various points throughout this track - and elsewhere on the album - the instruments take a break from classic metal power chords and riffing to play harmonies, but not as melodic lines so much as three-person chord outlines. The effect is at once heavy and spacious, and no other metal act was doing it at the time. Then, as the listener adjusts to the new-found Fates Warning guitar "sound," beloved original singer John Arch hits us with innovations of his own: layered, contrapuntal vocal tracks that display both the virtuosity of his voice and his own flair for composition. Awaken the Guardian also introduced Fates Warning fans to something else that has remained a staple of the band's work ever since: The introduction of, and heavy reliance on, clean-toned and acoustic guitars. Sure, plenty of bands have played clean, and then played dirty; plenty of bands have mixed acoustic passages into songs; but Fates Warning is the first band I am aware of that has played a heavy song all the way through with one guitar playing clean and the other playing dirty. This, too, goes back to Matheos' complicated harmonic ideas, many of which cannot be expressed clearly with distorted electric guitars. By keeping his own guitar clean, he was able to introduce a level of harmonic complexity that other metal bands of the time just couldn't touch. And it's not jazz, as so many other progressive bands find themselves when they get complex. Matheos' origins were always in classical guitar, so his harmonic approach reflects that direction. For Fates Warning, "progressive" doesn't mean a mish-mash of musical styles exploding in all direction. Rather, Fates Warning adds layers of classical harmonies to an ostensibly metal framework to create "vertical" rather than "horizontal" complexity, if you will. Anyway, the point is, Awaken the Guardian established this new writing approach as the backbone of the band's work, and set the stage for everything that was to come over the next three decades. The band's transition from "old-school metal band" to "progressive metal pioneers" would not come without casualties. In this case, the band bid farewell to original guitarist Victor Arduini, and welcomed a player who was better-suited to the band's new direction. The incredible Frank Aresti proved to be up to the task. Aresti came to the band with a whole new arsenal of licks and approaches. His style simply fit the band's newer direction better, and his playing on Awaken the Guardian is testament to that; from the intricate acoustic interplay between he and Matheos to his lighting-fast and innovative lead work, Aresti's performances on the album demonstrate that he was up to the task and then some. So: As the band's first real artistic declaration of who and what they were, Awaken the Guardian proved to be the gateway drug for old-school metal fans to Fates Warning. For fans who came to the band later on, as I did, the album serves as a fascinating window into the sounds and structures at the heart of the music. Either way, this album is a killer.